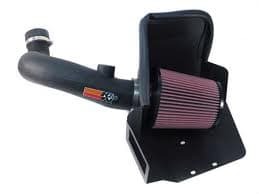 Air Filters are used to help increase the power, performance, and acceleration of any vehicle, and are very useful in improving the performance of Pickup Trucks. Here are three kinds of Air Filters that you can use to improve your Pickup Truck. K&N is considered by many who have them to be the best in the business, and consist of six layers of cotton gauze treated with oil, sandwiched between two Aluminum mesh screens. They are washable and can be re-oiled with a cleaning kit which K&N suggests using about every 40,000 miles, and they are considered to be long-lasting, with their own million mile limited warranty, which is well within the life of most Pickup Trucks. Also K&N guarantees this will not void the Truck’s warranty if it is added to your Truck. It is the most expensive of the three at roughly $75. Another popular choice is the AMSOIL Ea Filter, which unlike the K&E uses Nanofibers to collect dust and dirt from getting into any Truck. Like the K&N it’s washable and reusable, though AMSOIL asks that it be done at every 25,000 miles or annually, whichever comes first, and it’s been shown to collect a lot more dust that the Cotton-mesh combo that K&E uses in their Filters. In addition, this costs about half the price of the K&E at $40, making this the cheapest of the three, however it has a shorter warranty of 100,000 miles/4 years. The third Air Filter being examined is the aFE power magnumFLOW OER PRO 5R Filter. Like the K&N, this is a Cotton gauze, but it uses five layers rather than six, and it comes without the aluminum mesh screening. It’s kept in a Polyurethane Frame to properly fit inside your Truck, and like the others shown is washable and reusable for as long as you have your Truck. In its performance it is shown to have similar results to the K&N, and just like the K&N, it has a limited lifetime warranty. It is similar in price to the K&N filter at about $70.